Monday May 1st 1899 It was a fine day. I began cleaning house. I got the carpet out of the north bed room and the boys room, and got the floors cleaned. [Pink?] did not come. Tuesday May 2 1899 It rained this morning so Will helped me put down the two carpets, took up the kitchen carpet and changed the stove to the other end of the room. Ott stopped on his way to Lone Tree and stopped for supper on his way back. I put in the afternoon at work on the kitchen. 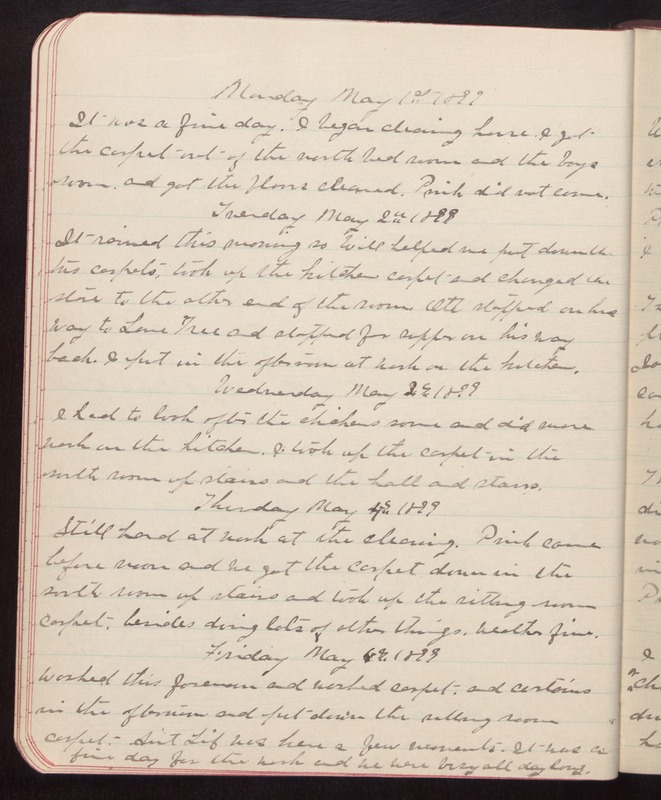 Wednesday May 3d 1899 I had to look after the chickens some and did more work on the kitchen. I took up the carpet in the south room up stairs and the hall and stairs. Thursday May 4th 1899 Still hard at work at the cleaning. [Pink?] came before noon and we got the carpet down in the south room up stairs and took up the sitting room carpet, besides doing lots of other things. Weather fine. Friday May 5th 1899 Worked this forenoon and washed carpet and curtains in the afternoon and put down the sitting room carpet. Aunt [Lib?] was here a few moments. It was a fine day for the work and we were busy all day long.